Translating Yona Friedman’s ideas of participation, Lucie Dadakova designed these ‘Multilevel Vertical Urban Allotments’ as her final year project for an Interior Design degree course. Dadakova focused on garden allotments due to both their individual and communal nature. She notes, “Each plot bears the signature of its owner, and the shared enterprise of improvising a small-scale landscape is a source of endless originality.” Allotments offer a great alternative for those living in flats without gardens, particularly within urban areas. Dadakova’s project aims to bring an innovative solution by making use of derelict and underused buildings in cities. 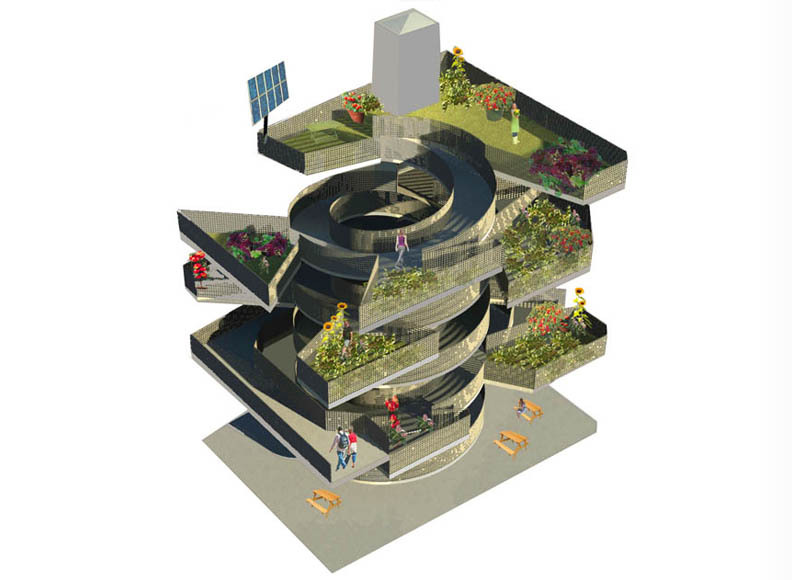 Translating Yona Friedman’s ideas of participation, Lucie Dadakova designed these 'Multilevel Vertical Urban Allotments' as her final year project for an Interior Design degree course. Dadakova focused on garden allotments due to both their individual and communal nature. She notes, “Each plot bears the signature of its owner, and the shared enterprise of improvising a small-scale landscape is a source of endless originality.” Allotments offer a great alternative for those living in flats without gardens, particularly within urban areas. Dadakova's project aims to bring an innovative solution by making use of derelict and underused buildings in cities.